A Splash of Red commemorates the triumphs and travails in the life and art of Horace Pippin. If you’re from the Philadelphia area, you’re bound to know of Horace Pippin, but in case you’re not: Pippin was an early 20th century self-taught African American artist whose talent was widely recognized after N.C. Wyeth assisted him in exhibiting his paintings. Although Pippin’s experiences in World War I rendered his right arm useless, they are what turned him into a full-fledged artist. Haunted by the images of war, Pippin found a way to transform his experiences as a soldier into art by using his left hand to guide his right. He spent three years on his first post-war painting (The End of War: Starting Home) using black, white, grays, and here and there, a splash of red. Claiming that “the war brought out all the art in me,” Pippin went on to create 140 paintings. They include Biblical subjects, scenes from his childhood, and works with a message of social justice. Pippin’s paintings are prized for their composition, form, and color. The text of A Splash of Red begins with the dawn of the day Horace Pippin was born and ends with him as a grown man painting at night. What transpires in between is a recounting of formative events in Pippin’s life in simple text that is easily accessible to children. 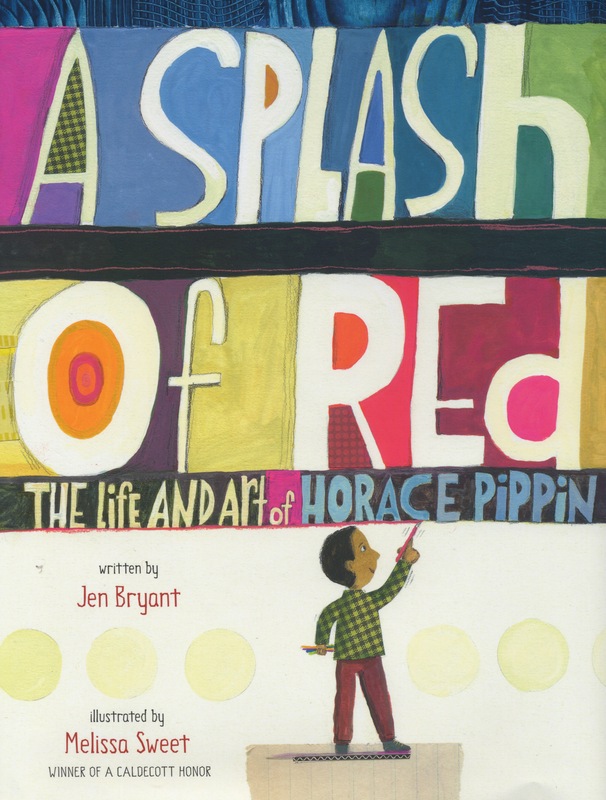 Jen Bryant introduces features that are important to Pippin’s childhood—his large hands, his grandmother, and his generous heart—and artfully weaves them into the different phases of Pippin’s life. The repetitive sentence structure gives the book a tone that is more poetic than didactic. Through the different phases of Pippin’s life, Bryant returns to the refrain, “Make a picture for us, Horace.” And Horace did. It’s a technique that weaves together the disparate pieces of Horace Pippin’s life in an orderly, predictable way. Melissa Sweet’s illustrations are bold and bright. Though her color palette is nothing like Pippin’s, she uses other techniques that resonate with his work. The mix of upper and lower case letters in the Pippin quotes and the mixed media of the artwork convey an unschooled quality. And the lined paper in the background and wood grain in the foreground of some of the illustrations contribute a rough hewn effect. It’s fun to spot the references to Pippin’s paintings that have been incorporated into the illustrations. I have yet to see the entirety of a 28 minute video on Pippin’s life called Horace Pippin: There Will Be Peace, but the 2 minutes that are posted on YouTube are a great advertisement. Hearing Horace Pippin’s voice in the narration certainly helps to bring him to life! This entry was posted in Recommended Books on April 2, 2014 by lwhulbert.